You are here: Home / restaurant deals / Get a $25 Restaurant.com gift card for as low as $3! Restaurant.com has a HOT promotion right now: you can save 70% on Restaurant.com gift certificates, which means that a $25 gift card to some locations will only be $3! This promotion is valid through 10/10/11. 3. When you add items to your cart, make sure you enter the promotional code “SALE” in the yellow discount code box at the top of the page. Complete the check-out process. You can also get 50% cash back when you shop through ShopAtHome.com. If you are new to ShopAtHome.com, you will also get a $5 cash back bonus after your first purchase, which means your gift certificate could be just $1.50! Spend $6 + $10 (because our total would be at least $35) and $6.30 for the 18% gratuity – we’re getting a meal that would have been $41.30 with tip for $22.30. That’s basically half price! Sounds like a good deal to me! 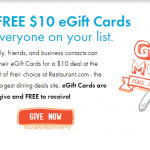 Get a $25 Restaurant.com gift card for as low as $.50 today only! Thanks so much for posting this great way to save while eating out. Its a great way for me and my honey to try new resturants and food we wouldn’t normally, plus it helps when neither of us can decide where to go.